Today, I’m thrilled to have Grant Yuan on the show. Grant runs the EcomCrew podcast along with Mike Jackness who I had back in episode 119. Anyway, Grant runs a bunch of different businesses which include a cutting board store at CuttingBoard.com and a few brick and mortar stores like Cinnabon. But the reason I wanted to have him on the podcast is to show how you can take something simple and saturated like cutting boards and turn it into a thriving ecommerce business. How Grant makes PPC ad campaigns profitable. 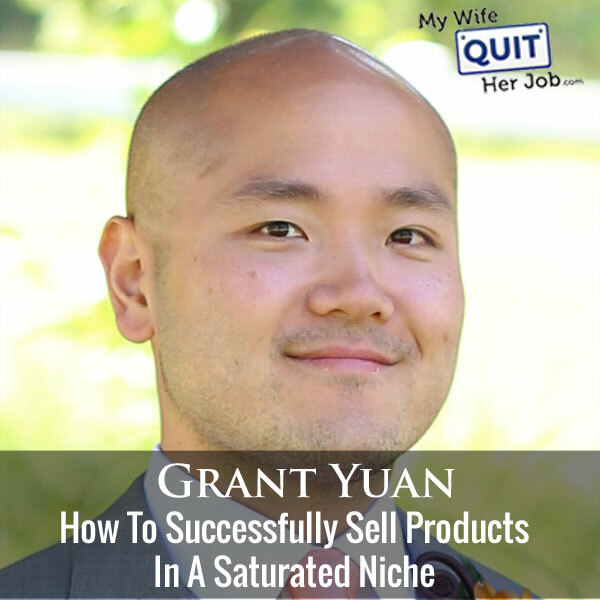 Today I’m thrilled to have Grant Yuan on the show, and Grant runs the ecommerce store cuttingboard.com where he sells cutting boards, and he’s actually going to teach us how to be successful selling saturated products online. Now before we begin I want to give a quick shout out to Klaviyo who is a sponsor of the show. Now I’m super excited to talk about Klaviyo because they are the email marketing platform that I personally use for my ecommerce store, and I actually depend on Klaviyo for over 20% of my revenues. Now you’re probably wondering why Klaviyo and not another provider. Well Klaviyo is the only email platform out there that is specifically built for ecommerce stores, and here’s why it’s so powerful. Klaviyo can track every single customer who has shopped in your store and exactly what they bought which allows you to do many things. So let’s say I want to send an email to everyone who purchased a red handkerchief in the last week, easy. Let’s say I want to set up a special autoresponder sequence to my customers depending on what they purchased, piece of cake, and there is full revenue tracking on every single email that I send. Now Klaviyo is the most powerful email platform that I’ve ever used and you can try them for free at mywifequitherjob.com/K-L-A-V-I-Y-O, once again that’s mywifequitherjob.com/K-L-A-V-I-Y-O. I also want to give a shout out to my other sponsor Seller Labs, and specifically I want to talk about their brand new tool Ignite which helps sellers manage their Amazon sponsored ads. Right now I’m actually using this tool to manage my Amazon sponsored ad campaigns, and it makes things a heck of a lot more convenient. So number one I’ve always found it a major pain to generate my PPC reports on Amazon, cut and paste the data over to an excel spreadsheet and use pivot tables before I’m able do any analysis. But Ignite pulls all that info for you automatically and allows you to easily see what keywords are working and what are not immediately, there is no need to manually create reports or play with excel. Second of all unless you’re a data geek, Amazon campaign data can be hard to understand, and what’s cool is that Ignite makes keyword and bidding recommendations on the fly that can be applied with just a couple of clicks. So let’s say one of my hankie keywords is bleeding money, Ignite will alert me of that fact, and I can reduce that bid immediately. So bottom line Ignite makes managing your Amazon sponsored ads so much easier and the fact that they provide me with alerts means that I no longer have to monitor my campaigns like a hawk. If there are keywords that are doing well, Ignite tells me to add them to my exact match campaigns, if my keywords are losing money, Ignite tells me to either remove the keyword or to reduce the bid. So head on over to sellerlabs.com/steve where you’ll find awesome tutorials on how to run Amazon PPC ads and the opportunity to try Ignite for 30 days for free. Once again that’s sellerlabs.com/steve. Now on the show. Steve: Welcome to the My Wife Quit Her Job Podcast, today I’m thrilled to have Grant Yuan on the show. Now if you don’t know who Grant is, he runs the Ecom Crew podcast along with Mike Jackness who I had back in episode 119. Now if you’re a listener of the Ecom Crew podcast, you probably haven’t heard from Grant in a while because well he’s been busy working on his businesses. Mike has been hamming it up and monopolizing the microphone and going off on color. In fact word on the street is that Grant is the brains behind everything and is the better half of the relationship. My plan is actually arrest this guy away from Ecom Crew to join My Wife Quit her Job. Anyway Grant runs a bunch of different businesses which include a cutting board store at cuttingboard.com and a brick and mortar store like Cinnabon, but the reason I want to have him on the show today is to show how you can take something simple and somewhat saturated like cutting boards and turn it into a thriving ecommerce business. And with that welcome to the show Grant, how are you doing today? Grant: Hey Steve, I’m doing great, thank you for having me on the show and thank you for the kind words beforehand, and I mean my goal is closing one another, but it’s very beneficial when we have a third party to help break the dispute. Obviously I am – there’s going to be the better half, I don’t know what to say about that, so now that I’m here now that you’ve said it it’s got to be true, right? Steve: Of course, yeah I mean it’s always fun to [inaudible 00:04:54] Mike, I mean he’s just so easy. Grant: Yeah, he just has to like maybe pour out a coloring bag in like his frustrations after he hears this podcast about it. Steve: So give us the quick background, your background and how you got into ecommerce and maybe touch upon what it’s like working with Mike at the end who knows. Grant: Yeah so Mike and I we’ve had a very long learning background obviously and of course we’re actually friends not friendenemies sometimes we pretend we are, but we were doing quite a bit of affiliate marketing back in the day, and at one point we realized even though the business was doing really good that we needed to have a lot more value than we were bringing. It really dawned on us after we had a seen a lot of what was happening in the Google side of things that we needed to pull it. I know that’s almost overused word these days but the reality is the affiliate business is more or less going the way of the turtle [ph] bird, there are things that will stay around but we decided that rather than waiting to see what was going to happen we needed to offer something of value. So rather than just recommending or doing a business where we drive traffic and then unload it to somebody else, we had to take that traffic and then build upon that. So we decided that ecommerce was going to be what we were going to do since we know how to build traffic and for better or for worse we got into selling fitness equipment as the very first thing which is death by sales and cuts in some ways, but it’s also it was a huge learning experience at the same time. Steve: So why cutting boards? Grant: That’s an interesting question as well. I would say it was more an opportunity than anything, and a lot of what Mike and I do is when we go and find ideas, I wouldn’t say we’re so smart as to find a wonderful niche and then go attack it, I think that would be giving us a little bit too much credit. We find domains that are available and we find an idea that we believe that we can capitalize on. So we take a few things, the cost per acquisition, the competitive niche of the industry and then we kind of factor those two and figure out based on search volume and a bunch of other things whether or not we should go for it and then we just go after it. So it’s a clamor of opportunity really more than anything. Steve: So you chose to sell cutting boards because of the domain or – what was the primary rationale for going to cutting boards of all things? Grant: Yeah the domain was available, I know it sounds completely ridiculous, but that’s what it was and it wasn’t exactly available, it was owned by a restaurant owner in North Carolina that sold barbeque and I figured that he probably wasn’t going to put the domain to good use as well as I was. I wouldn’t say that he got a bad deal out of it, he definitely got a fair amount of money, but I’m pretty sure I’ve added a whole lot more value to that domain during the me time. Beforehand though how much did I know about cutting boards? I would say not too much and now I know a whole lot more, but I do have a fair amount of passion for it. I think it’s a really interesting market, I do a lot of cooking, so it wasn’t that bad for me to jump into, I like what I do and that matters a lot. Steve: Okay, so in terms of how much you paid for the domain, is it like four figures, five figures, like what are we talking about here? Grant: It was like low five figures. Steve: Low figure figures, okay wow. So do you recommend that people do that today, like if there is a good domain, like build a business around that? What I’m trying to ask you is how important is the domain in terms of ranking; I would imagine you got these domains for ranking purposes, right? Grant: Yeah, Mike and I we get a lot of keyword domains and you can probably find 100 opinions if you ask 100 people in the industry. Our opinion is that keyword domains do matter and if you can find one and if you can build on it, it makes life a lot easier and that really kind of explains our MO. I would say that there is a lot of people that do just fine without it, I mean you’re look at somebody like Man Crates, I don’t think anybody was ever switching for a Man Crate before that came out or a Modcloth or any number of brandable companies out there. It just so happens that we come from an SEO background and we know how to attack that angle the best. If you come from a generic marketing background, then Facebook and your other ads could do just as well, but it really depends on your core strength I suppose. If you think that SEO is the way to go then keyword domains are great, if you belief that marketing and branding is the best way to go, then I don’t think it would matter. Steve: So how much of a difference would it make between getting like cuttingboard.com versus like cuttingboardhq.com or something along those lines? Grant: Or like mikeswood.com or something like that? Steve: Well something with cutting board in it but maybe with like a small third word, you know what I’m saying? Grant: Got it, it’s a pretty big drop off, and based on what we’ve known from previous experience in the industry if you were to put like a numeric scale to it, if you had the keyword domain such as cuttingboard.com, I would assign like a weight of ten, and if you had cuttingboardfactory.com, I’d probably assign anything other than the poorer version down to like a six or a five at best. Grant: Once you get into the three word, or anything like that you start losing off on a lot of the main branding ability and also the keyword strength. What I mean by that is for example long tail keywords, for example let’s just say you’re selling bike parts and you could have bikeparts.com, but then you might have twinbikeparts.com, you might have stevesbikeparts.com, the long tail just becomes infinitely bigger once you get to a three factor out there. So when you have the two factor, just two words of bike parts, then you have a whole lot more broad encompassing search visibility, but it also requires that you do a whole lot more optimization. So a lot of it is requiring that even though you have this great domain, you need to know how to utilize it properly. So yeah even a guy with a million dollars is a great domain it’s not going to do anything unless he knows how to work it properly. Steve: So in terms of the domain, is this all from your experience buying domains in terms of like your rating factors? sounds really boring. I’m like it kind of is, but nowadays people are like, oh yeah data cool, big data. So back in the day how do you find data, well you organize it, then you index it and then you put a search engine on top of it. So I kind of understood what the search engines were looking for especially back then was the computational abilities that was then. There is only so many things that you can do to really be able to filter out and do like in other rankings and everything that Google did, so a lot of the methodology that we used started off from a very engineering focused standpoint where we kind of reversed engineered like why would an engineer do it this way or do it that way. Most people tend to go by the old lady says that a horse rides throughout the sky and drags like a big ball of fire behind it, and so the old lady says this and that’s kind of how most people do SEO. They go on forums and they read everything, but I really do think that if you have an engineering type of mind and especially software development mind and think about things rationally and try to understand systems and databases, now it’s going to be a whole more complicated but you kind of try to piece it together from almost like the molecular level up until the engine has failed, then you can really truly understand what is going into the search engine optimization. So that’s like a long way of saying that being there from the very beginning from the early days of SEO, I think I’ve had the benefit of seeing how the theory and application of SEO has developed throughout the entire time to what it is now. This is equivalent of growing up learning how to work on something simple like a 1970s mustang, then now you’ve got like a Tesla. If you start with a Tesla you’re going to be completely overwhelmed because it is electronic and nobody knows what the hell is going on underneath. Steve: Okay we’ll get into that in a little bit, but first I want to talk a little bit about the business itself, so first of all are these cutting boards drop shipped or do you store inventory or do you have your own brands or all three? Grant: We do a little bit of each, I would say that we warehouse most of it, and from our experience in the drop shipping side Mike and I both felt pretty burned in the fitness industry. When you can’t keep a promise to your customer, it makes life very, very difficult and if anything in the ecommerce face, and I’m sure you know this all too given your customer base as well, they don’t react well when you don’t deliver on promises especially for high value items. If you have a low value item I think that your error ranking get a lot higher, but that said ecommerce is pretty brutal, people make a lot of noise when things go wrong and it gets published prominently, and so you don’t have a lot of room to screw up. So drop shipping I try to avoid it when I can because of those kind of problems, so I tend to inventory. Steve: Okay and then cutting boards are heavy and so does that imply you have a warehouse like a big warehouse? Grant: Yup I’ve got multiple warehouses. I use a warehouse in the East Coast and then I serve a warehouse myself and then I use Amazon for different items, but I try not to rely on Amazon for most anything that’s important, which is kind of the opposite of most other people and maybe even Mike. Steve: Yeah actually Mike has gone all Amazon for fulfillment even, but I’m curious what your rationale is for having both the 3PL and your own warehouse? Grant: Yeah shipping like zone 7, zone 8 all the way from Seattle and so anybody paying attention UPS and FedEx when they break apart their parcel, shipping they base it on zones and anything local to you is probably a two to three zone, and then for me I’m based in Seattle. So Texas and the mid west would be zone four or five, and then the East Coast and the North East would be a zone seven, eight. Yeah it got very expensive, when I started off I would ship a package to Texas and it would pass me about $25 to New York or Maine and may end up costing me almost $28, $29. That was with a discount through a consolidator, and without a consolidator I probably would have paid $35 to New York and when you consider my product itself my cost fully, you’re getting to you’re not going to make money margins over at that point. So it was more of I had to get this done rather than I wanted to. Steve: Why not a 3PL in both places? Grant: That’s a good question. One of the things that prevents me from getting a 3PL for the west coast is we have a little bit of customization that we do on our products, and that ends up mattering quite a bit for us. That’s kind of the direction that we’re looking to go, so the other issue too is that starting off the business, I’m really, really big on understanding your product more than anything. The lessons that we learned from shipping ourselves, we applied it to our 3PL, so we reduced our return rate, we reduced our breakage rate, we reduced our dimensional – I mean everything like that. The other thing too is that now after having done it for three years I’ve just renegotiated my small parcel rates, and we’ve got some amazing, amazing deals and a lot of that is just because I understand all the ins and outs of shipping now. Steve: What are some things that you learned that you actually applied to the 3PL; can you give me an example? Grant: Yeah absolutely, so just the way that our boxes are being packed and everything, we went through about five different configurations on how we pack our cutting boards. When we first did it we just did a paper and wood and pretty much they would just get beat up especially on a long haul, they just got dropped a lot and who knows what, but they just weren’t being protected. Then we tried bumble wrapping and then we had other issues, too much time to get it done. Then we finally figured out these custom form quarters that we put in there would work out, and there was quite a few other things that we just kind of realized going in that we had to explain to our 3PL how to do from the get go. Otherwise if they simply did it their own default way which is almost the way Amazon does it, you have a small item thrown in a big box and it gets slumped all over the place, and then you have a lot of damage. Steve: Okay, I see, it makes sense. Let me ask you this though and this is something I’ve just been thinking about, what’s special about your cutting boards versus me going to like a Bed Bath & Beyond and picking a cutting board, why would I want to pay $40 in shipping or $25 in shipping? Grant: One thing is that we do have free shipping over 75, I know that’s a pretty high limit compared to what a lot of other people are, and your question is really on point though. If you’re buying something under $50 you most likely are not going to be buying from us, and I don’t really cater to that kind of audience as well because of exactly what you said, you can buy a bamboo or plastic cutting board anywhere, and honestly I don’t really want to compete for two to three dollars, it’s not a good market to be. So we compete at the higher end, our average order is going to be in the $100 range. The boards that we sell, you can’t really get them at Bed Bath & Beyond. You can probably them at Williams Sonoma or Sur La table or another high end type of place, but in that way our product is pretty niche unless you’re a business and you’re buying just a big volume of cutting boards, and we were pretty competitive on that side. Steve: Okay, so you basically cater to people who are really in on that cooking I guess so to speak? Grant: Yeah definitely that crowd, and it’s kind of a interesting mix, we don’t really have a true finger on our audience which is really bothering to me and Mike always keeps telling me, oh man I don’t understand how you’re not on Facebook anymore. My explanation is that it’s actually really hard, our demographic is all over the place and even a look alike doesn’t always perform that well, and it’s old people, it’s young people, a lot of people buy them as presents, and cooks who like cooking anything from the CEO to a triathlon runner to the guy playing video games to Ali that’s doing [inaudible 00:22:22], it’s really hard to say. Steve: So you’re not running Facebook ads because of this? Grant: When we do run them, it gets pretty cost prohibitive at some point unless say a certain time of the year like the holidays. So we run them pretty strategically, but if we run them all the time my feeling is that because it a commodity type item and because the price point is so high, it doesn’t quite make it into the impulse buy type of Facebook kind of golden goose territory that you really need your Facebook ads to be in. Steve: Okay can we talk about like the commodity part a little bit, you said you sell other people’s products and you have your own line. What is the split in terms of your sales for that? Grant: Before when we started we were obviously not making our own just because of the risk factor involved, but I would say we went from being 100% of reselling other people’s products and now we’re closer to 50% resale and then the other 50% is our own product. That’s after gross margins like when you start off at 50% cost of goods and then you’ve got another 30% shipping and then add in the 3% merchant fees and everything like that, you kind of wonder what am I doing here? Is this a business or am I running a charity where I hope to get food donated to me? So we really had to again do something based on necessity of the business more than anything to start getting our own product in. So sourcing was a really, really important part of the business. Steve: Okay so that was always part of the game plan, right? Grant: I would love to say that I had a massive game plan in the beginning. The thing that I essentially knew and I’ll be pretty honest about this, we knew that there was a good amount of traffic going there in terms of search terms, and I knew that I would do probably pretty well ranking, but after that I was going to let the customer dictate what I was going to do. So in the very beginning I just put up a smart [ph] board of everything on to the site to see what stuck, and then once I know what was doing well, then I started trying to source that product. So in a way it’s kind of reverse engineering and yet I can’t talk, it’s kind of reverse engineering what the customer wants and then going from there. Steve: I want to take a moment to thank ReferralCandy for being a sponsor of the show. Now in this day and age word of mouth is a huge driver of business for most ecommerce stores, and the best way to amplify word of mouth marketing is through a referral program. This is where ReferralCandy shines, with just a couple of clicks to the mouse you could add a referral program to your ecommerce store and reward your customers for telling their friends about your shop. And this tactic works wonders; and in fact it is not uncommon to get a ridiculous return on investment. So for example Greats Footwear who is a ReferralCandy customer is currently seeing a 20X ROI. Referral word of mouth marketing is also useful for building up your social media presence as well, because everyone is talking about your company with their friends on Facebook and Twitter. And the best part is that ReferralCandy is a set it and forget it service, requires no technical setup and they are giving My Wife Quit Her Job listeners 50 bucks to try them out if you go to promo.referralcandy.com/steve. Once again it’s promo.referralcandy.com/steve to get a $50 credit to try out the service risk free. Now back to the show. Okay so I noticed just today I just typed in cutting board and you are the number one spot for cutting board, so a couple of questions, is SEO your primary source of traffic or do you have other sources – what are your top three sources of traffic and sales? Grant: Yup we do AdWords. Grant: Yup, and the other source of traffic is just going to be I’d say email marketing. Steve: Okay, let’s talk about SEO because we kind of started this conversation out that way, how the heck do you get the number one spot for cutting board and how much does the domain have to do with that? Steve: Yeah you got proof. Grant: More way behind what I say, but I don’t want this to be Grant says buy keyword domains so everyone goes to buy keywords domain, it doesn’t quite work as easy as that. I already forgot the other part of your question, I apologize. Steve: Okay so ranking today still depends a lot on links, so I imagine you achieve that along with your domain by building links, right? Grant: Links are definitely really good and I don’t think I would ever be in the camp that links are not relevant and a lot of that still comes down to the fact that if we do the engine comparison we’re still running on combustion engines and Google still runs on link as paid link. Anybody that says otherwise simply does not have a fundamental understanding of the technology and pockets like implementation of how Google works. The page rank algorithm has been there forever, it’s been modified heavily over the years that it’s been around but at the base of everything it comes down to linking. Now anybody that takes that at face value and just goes out and buys a bunch of links is going to get completely monkey hammered because of the granularity that you have to do when you apply that type of strategy. So links do matter and content of course matters, but I think what people really make a mistake on is that they go for volume versus quality, and I think that’s really been our fundamental approach during all of our time doing SEO. Steve: So what is your strategy for link building, like can you just kind of walk me through how you get links? Grant: For one thing I don’t automate anything which puts me probably in the 1% and I think most of – I see people out there automate, a lot of them use other — I would say maybe 30 to 40 – I mean it’s hard to say for sure, but if I had to guess probably at least half of the SEO people out there are using techniques such as just black hat, or they don’t know they are black hat and they’re just going to get them banned. Steve: Just to be clear, you’re not black hat at all, right or grey hat even, are you like pure white hat? Steve: Yeah [inaudible 00:30:58] stepped down too. Grant: Yeah exactly and he’s kind of has a vested interest in protecting Google and not making his life harder, but all the black hat guys out there play by a whole set of rules and they obviously go for links and they go after a lot of like social media linking. Steve: Yeah it’s actually amazing like this whole world of buying links was kind of exposed to me relatively recently, within the last couple of years where you can buy links on really high class publications, it’s crazy. Steve: But you’re not doing that, so let’s talk about like what you do. Grant: So what I do and this is why I actually think I’m fairly successful at SEO for this whole time is that I’ve always approached it as a humane problem as a opposed to a technology problem, and that’s going to sound really bizarre, but it’s almost like the idea of how many people know their neighbors these days, for example do you know your neighbor Steve? Steve: I do mainly because I want them to be on the lookout for me like when we go on vacation and stuff. Grant: Okay, got it. How many of the people down the street do you know? Steve: Not as many, we know our immediate neighbors the best. Grant: Okay and I think this is a common answer for just about everybody. I would say most people probably don’t even know their neighbors these days, and to me that’s kind of the difference of SEO by automation versus SEO by manual nature which is that getting to know your neighbor is difficult because you’ve got to go out there, you kind of have to expose yourself and you’ve got to really literally go door to door, knock, say hello, make friends, put effort essentially. Steve: Are you talking about in person or just outreach like email and Skype and that sort of thing? Grant: Both, I mean I’ve been known to call up people just to introduce myself and obviously if you call up somebody with the whole idea of getting a link, then that’s really scummy in my opinion, that’s like cold calling to do sales, and that’s where I think a lot of SEO guys fail because they don’t have any other objective in life other than to do sales. I think that if you actually have the objective of building a long term relationship or helping somebody out, then I think that is a huge amount of benefit to you both. Steve: Let’s talk about like one of your strongest links that you have built, and talk about how you approached even starting that relationship in the first place. Grant: Okay yeah sure I would be glad to. This actually goes back to one of my older websites; I actually had a website that was doing food reviews back when Citysearch used to be popular if you remember that website. Steve: Credibility, it’s all gone yeah. Grant: Yeah exactly. I got penalized, this guy doesn’t know what he’s talking about. To cut the long story short is I actually belief and I still even to this day I’m not totally sure why I got penalized because I was completely white hat on that side, but I actually believe I got penalized because I rose up too fast in the amount of quality links I was getting. So I beat some kind of predetermined velocity profile and I just hit it out of the [inaudible 00:35:15] my pack and they just said no, it can’t be real, and then they just like bully [ph] me. So part of that, when I was doing that I had a website that catered to just telling people where to go get food, and so naturally I got links from food bloggers and everything like that, but what I really wanted to do was get links from high level authorities like the Seattle city government website, the other major institutions in the area, there is a few like big hospitals and a lot of people flying to Seattle for great medical care, we’ve got very, very good health care over here and doctors. So when you are in the area you want to find a place for food. Nowadays you can go to Yelp of course but back then you really had to look. So to me hospitals were like a great source of links and you might say, well how on earth do you get a hospital to link to you? My whole approach was just to start calling up people. Steve: You called people at the hospital? Grant: More or less, I mean essentially I built like a brochure like a catalog of places to eat and everything like that and put it in a nice little brochure and I called them up I was like, hey I know that you guys offer services to families that are around in the area and you know a lot of them move for a night and they need to place stay, I’ve got a few restaurants over here and they offered coupons specifically for you guys. I put this brochure together and I’d be happy to put this over here, I’m not getting paid for anything but our whole organization, all we do is we recommend restaurants, that’s all we do and we have a website and you can see it, so would you be interested? I would say 80% of the people said yes, I mean they didn’t say yes immediately, there was a lot of well we got to go check in with their people, and I would say out of that 80% none of them got back to me and then I followed up again. I never followed up within like two days or anything, I took my time just kind of slowly but surely in this kind of stuff and then eventually I made my way in a whole bunch of ways like that. Steve: How did that work for cutting board though, like you’re actually selling something on the site, right? Grant: I think your cancer patients, a cutting board over here, but the idea is fairly similar. I do things like try to get my name out there for various like do good things. So if I find that there is a program that’s in need of cutting boards or whatever, it’s like a match, we’re going to show up and be like, hey pretty guys need cutting boards and I’ll offer them like a nice package or something like that. Steve: Like a cooking event or something? Grant: Yeah or help sponsor for example there is like culinary schools out there and a lot of them do job training programs, so I might give them like a scholarship or something and say, hey here’s something for you guys. If you want to link to me that’ll be great, if not just – if you go send me a picture of something that shows the word summer. Here’s where I differ from a lot of people, I’m willing to put it out there and not get a return, and a lot of people are absolutely completely opposed to that, and they’ll say something like, well I tell you what I’ll give you $50 and you put a link back to me. To me that just sounds like garbage, I don’t believe in that. I think that’s very low class and I think that’s tasteless, that’s kind of like when I was asking about do you know your neighbors, do you go to your neighbor without knowing him and say, hey I’m leaving for a week to Hawaii, can you watch my house, feed the cats and pet my dogs? You go to your neighbors and I did this with my neighbors, it sounds like really, really cheesy but I went to a local pastry shop, I got like the nicest cake that I could find. I went to go meet my neighbors, like hey I’m Grant, I’m new to the neighborhood whatever. Steve: We did that same thing with fruit, we use fruit, but yeah we did the same thing. Grant: Exactly, so I did that with like my closest like six neighbors. I said hi to all of them, give them a big cake or whatever and now I can like talk to them. The same thing, there is this like a domain for example that I’ve been working on for cheese, it’s probably been three years at this point and every probably four to five months I just contact this guy and I say, hey how is the going blah, blah, blah and he’s trying to sell this domain for like a million dollars or so, and he might be able to get it, I think it’s unrealistic elevation but I just keep in contact with him. In the event that maybe he decides he wants to sell it one day, but I don’t go up to him and say, hey you’re going to sell, you’re going to sell, you’re going to sell. Obviously if he wants to sell for a price that I want to pay that makes him happy, then I’m happy to transact but otherwise I actually tell him, my advice goes against my own benefit and I’ll say something like, hey this guy got pretty big into the industry, I’d probably approach him to see if he can get you a million. The guy is like really, I’m like yeah, if you get it, good for you, if not I’m still here. Steve: So your strategy is just like a really long term, it’s more like human engineering so to speak, it’s like a long term strategy, you do good things, and then good things will happen almost? Grant: Yeah, that’s why I say my – I almost like hate to call it a strategy. Steve: That’s boring Grant, sorry I know. Grant: I know it’s called be a good human being and treat other people well, and understand that when you treat a lot of people well, a lot of people are going to treat you well back, but there’s going to be those that do like to be treated well and not treat you well back us too. I think that’s what the SEO world to me it’s like just a complete access pool of human cells because by nature of SEO you’re trying to take, take, take, take and you don’t give. It’s hard to find somebody that’s willing to give and be okay with the give and the take, so my strategy is not complicated, it just involves like altruism, and no expectations and good things happen. Steve: I will tell you this, my blog probably didn’t take off until I started going to conferences where I was just meeting a bunch of people making lots of friends in person, and after that started happening we just started kind of helping each other, and that was like a big turning point for both of my ecommerce businesses. So I guess, I mean it kind of is in line with everything that you just said, by becoming friends with other webmasters or business owners you can help each other and be mutually successful. Grant: Yup exactly, and I apply that to everything, I mean you mentioned Cinnabon. I know almost all of the Cinnabon guys up and down the corridor in Washington, Oregon, I’ve been to conferences. Every time I go there I try to talk to as many guys as I possibly can, and I’m not doing things like, hey how much revenue are you making, what’s your net profit, how much is your rent like, all this kind of stuff; I’m just here to get to know people, do all those kind of stuff. So I guess in a way I’m kind of like the true Chinese business man. Grant: We go and get drunk, we eat a bunch of food, and then somehow another like business mix in like a year later and nobody has mentioned anything about pricing, it just kind of shows up at your doorstep. Steve: Can we talk a little bit about your AdWords real quick. I know you are – for the stuff that isn’t your own I imagine your margins are less and there is probably other people selling that same product. So how do you manage to get Shopping and AdWords profitable for those ads? Grant: That’s a very good question; the reality is that I think depending on your industry you might not even be able to run AdWords profitably. Cutting board is commodity and there is a lot of people that sell it and unfortunately you’re going to have guys like Amazon, Macy’s, Bed Bath & Beyond and other people that are competing with me on the same product. Now they’re going to have better buying power, they’re going to have better logistics, they’re going to have better everything. So at the end of the day if they have a higher long time value for their customer, then they can pay a higher acquisition cost, and they also have a much deeper data set on with their buying, so they have a lot more trends that can work for them. In that case what I’ve always found is that if you try to bid for number one or number two spot, you’ll usually get your face ripped off if you’re not careful. That’s because you’ll get the most amount of clicks, usually the conversion rate isn’t always as good, so you’re willing to pay a premium to get those people, and unless you’ve got like extremely high margin product, you can’t really afford to be playing that tennis game of attrition with your competitor. So the way that I do it is I – it’s almost like the guerilla warfare of PPC, I mean I kind of go in there and like attack when I can, so I do a lot of day partying, I do a lot of hour partying, I go and I select states based on my shipping rate. If I’m in the North West and I’m shipping to Oregon, California, that’s really good for me and my 3PL, I can attack all those states around there really easily. Texas is a very hard state for me to ship to profitably, there is a number of other states that tend to have people that are in the bunnies and they tend to have like destination surcharges and everything like that like remote delivery, Wyoming would be one like North Dakota. They are not very populated but it’s one of those like if I’m not bidding 100% to cover California then why am I even bothering to bid Wyoming and other places like that. So it’s a very selective targeting, and when I do it too day partying is also pretty important because depending on your niche, most people generally do buy on a Monday and Tuesday morning and Friday people tend to turn into tire kickers and everything like that, weekends are generally pretty good, but it really depends on your industry too, and so our partying too. I think the number one mistake people make, they leave their ads running 24 hours, but anybody shopping to buy anything at two o’clock in the morning generally is a tire kicker, and you get lot of those tire kickers that click on just about every ad possible. So people that are bored have nothing better to do at 2:00 AM that are just shopping around, and so you get a lot of people just milking up your PPC cost over there. So yeah there is very few ways that you can go and attack the big boys because they probably – you just hope that they’re using an agency that groups everything into like one monthly percentage because there is executive up there saying what’s our ROI and somebody just says, oh 3% and he goes, okay. But that guy is not going to ask what’s our ROI on three o’clock on a Monday, and if they are 50% there, then you can probably go and make a nice little 35% right behind them, but if they are negative 10 on a Friday at 2:00 AM, then you don’t even bother showing up for that Friday, you just let them take it on the chin and then you find another day. So it’s really just like letting the big guy go down in front of you and you just kind of trail behind, so that’s kind of what I do. Steve: Okay so basically you run them and then you find out when the most optimal places, times and that sort of thing and then you just pick your battles? Steve: Okay. I also, we’ve been chatting for quite a while and I did want to touch on this a little bit, why brick and mortar like Cinnabon versus another ecommerce store, what are the pros and cons of each? Steve: Oh you actually go and work there yourself? Grant: Yeah remote workers and everything and just live a life of managing people, I think it’s more of a fantasy and a dream that we can aspire to, but the reality is that most of us will never be able to work that kind of situation. I say that because brick and mortar is – let’s say it’s been the business model that has been with us forever, physical stuff has been far more prevalent than online and not to say that brick and mortar is better by any means, I mean look at like Macy’s is closing 100 stores and The Limited all closing out. Retail is having a reckoning and that’s for sure and malls are definitely going to have a reckoning too. In the Seattle area our malls are generally A malls, malls are rated on A, B and C, and most of America is getting malls in the C rating which means that they are on the way to becoming extinct, but in demographics and metro cities they have been doing well, most are doing still very well. So you look at the Cinnabon which is a very basic operation and it’s a franchise and we make cinnamon rolls and we make people happy, that’s kind of our model, we wow people and it’s a good product, I enjoy making cinnamons and I enjoy selling them and people that come to our store are happy and at the end of the day we close up. At nine o’clock work is done and everybody goes home, then we start over at seven o’clock the next morning. Ecommerce kind of runs all the time, so the idea that — a brick and mortar is to me much more scalable on a passive kind of income type of objective if you are a people person, because you can hire people that will have your interests and you interact with them and you hire managers. Ecommerce scales rapidly, ecommerce can do a lot of things really good. The trouble with ecommerce though is that you’re competing against the best, the brightest, the smartest, the most overworked people in the world which are hungry young men essentially [inaudible 00:51:29] women. I mean there is a lot of women entrepreneurs out there so I don’t want to discredit them, but everybody knows that there is like advantages in ecommerce, so you have a lot of smart people coming in to the space and try to attack everything. You also have a lot of guys with a lot of big pockets such as [more mark hims] [ph] on everybody trying to go after a lot of market share. You compare that with Cinnabon which is more of an effort based kind of business and there is certainly nothing that’s going to get very creative, it’s a very standard business that has very set rules that have been applied at the franchise level, but my competition is simply the weather. Grant: My long term existential competition is Amazon to take wells and moles [ph] but if my moles are in a metropolitan area that has a high paying demographic and they keep coming to the mall, then I don’t really have an existential risk. Every year I know that my rents are going to be going up by 2% on a steady basis, I know that I’m going to get traffic. Ecommerce I don’t know what’s going to happen in three years, is Amazon going to destroy everybody, are they going to eat my cake, am I going to get penalized by Google because I said something stupid on this podcast because Steve is so popular. Some of the others are like, oh well Grant is doing some black hat stuff and that’s kind of the crux of it which is that the viability of both models, there is something very, very different about it. So for me I wouldn’t go so far as saying that one is better from the other, but I would say that it is a good divestment or a good diversity edge. If one thing happens to me on one side, then it’s not going to happen on the other, and for as well as I’m doing on the cutting board side our Cinnabon stores we have multiple, they do more in revenue than I do on cutting board and it’s like that’s a much more simpler business and the margins are acceptable. They are not like ecommerce margins but they are definitely livable. If I had to do it I could probably run a Cinnabon store for the rest of my life and live my life in comfort, so it’s not a bad thing. Steve: Okay, interesting, cool. Yeah I think you’re the first person we’ve had on who does both ecommerce and brick and mortar, so it’s pretty interesting to hear. But Grant I’ve had you on for a long time, I really appreciate your time, if anyone wants to find you where can they find you? Steve: The good looking Asian dude. Grant: Yeah, yeah, and then there’s this other guy named Mike, so that’s my [inaudible 00:54:26] Mike out there, he’s my partner on Ecom Crew and we give each other grief all the time, but Mike’s a good guy. We talk business and we pretty much talk about everything that we do. So we try to be an open book and definitely enjoy being on your show too Steve. I hear nothing but good things from you about Mike, so I’m very happy to be able to have the opportunity to be on your show. Steve: Cool yeah likewise. I mean I chat with Mike pretty regularly and I just visited him in SD and to see that you guys don’t live closer or you guys could hang out a little bit more but yeah I’ve got nothing but good things about you as well and thank you for coming on the show. Grant: Yeah I appreciate it. Steve: Hope you enjoyed that episode. What I love about Grant is that he’s highly analytical and he knows his stuff. Go check out the Ecom Crew podcast as well. For more information about this episode, go to mywifequitherjob.com/episode163. And once again I want to thank Seller Labs. Their tool Ignite is what I use to manage my Amazon PPC campaigns. Instead of the old tedious way of generating reports and analyzing your ad campaigns in excel, Ignite aggregates all the info for you in one place and allows you to quickly visualize your data to make decisions fast. Not only does it save time, but it also makes managing your Amazon campaigns so much easier. So head on over to sellerlabs.com/steve and sign up for a free 30 day trial, once again that’s sellerlabs.com/steve. I also want to thank Klaviyo which is my email marketing platform of choice for ecommerce merchants. You can easily put together automated flows like an abandoned cart sequence, a post purchase flow, a win back campaign, basically all of these sequences that will make you money on auto pilot. So head on over to mywifequitherjob.com/K-L-A-V-I-Y-O, once again that’s mywifequitherjob.com/ K-L-A-V-I-Y-O. Now I talk about how I use these tools on my blog and if you’re interested in starting your own ecommerce store, head on over to mywifequitherjob.com and sign up for my free six day mini course. Just type in your email and I’ll send you the course right away via email, thanks for listening. Most importantly, I’ve been trying to get my wife to quit her job and start her own company, of which she wants nothing to do with. But now that I’ve been on your show, I now have the perfect excuse to get her to read through your site! Again, it was a pleasure being on your show and hope you’re having a great time at the conference. Saturated niche seems to be useless, But you are saying it can be again made an earning one. Thanks for your interesting and essential post. I’ll definitely use these tips for my niche.